Luis Suárez is golden again. 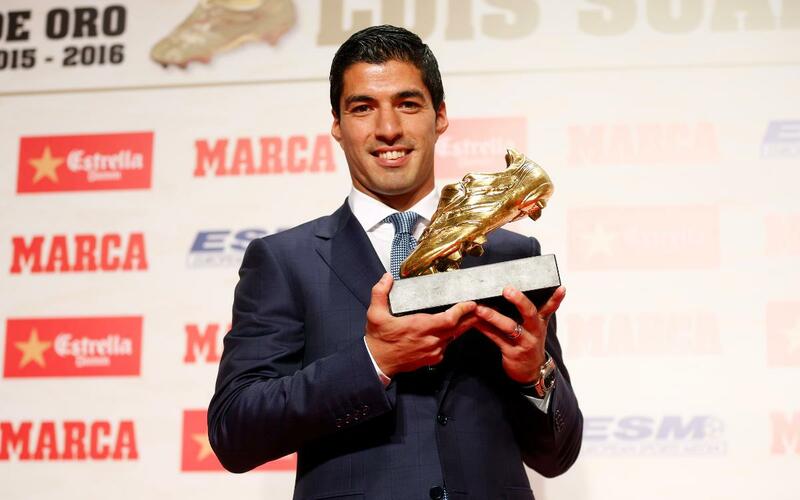 The FC Barcelona striker has collected the Golden Shoe for the 2015/16 season as the leading goalscorer in domestic European football after scoring 40 Liga goals for the Club last year. The ceremony included the screening of a commemorative video with messages from several people that have played a role in Suárez’s life, including Uruguay national team manager Óscar Tabárez, who described the striker as “the representation of our passion for football”. "My team-mates also played their part by making it all so much easier for me." While the other two members of the famous trident did score in the 4-0 defeat of Manchester City, Suárez failed to get on the scoresheet – which led to an amusing anecdote involving his son Benjamín when he arrived home late last night. Suárez was collecting the award for the second time in his career, after also winning it in 2013/14 as a Liverpool player. That season he finished level with Cristiano Ronaldo but this time he was the out and out winner, finishing four goals clear of second-placed Gonzalo Higuaín of Napoli.